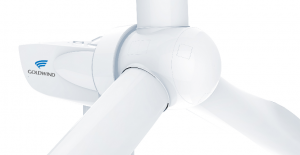 Goldwind has been setting a new standard in turbine technology for more than two decades. The Goldwind 2.5 PMDD platform, is part of that new standard. While the design principles of the Goldwind 2.5MW and 1.5MW remain much the same, one major difference between the two platforms is the single-bearing design of the 2.5MW PMDD turbine. The 2.5MW platform, a single rotor bearing solution, offers simplified design and major head mass reduction potential. Maximised output for low wind applications. The introduction of our latest 2.5MW class model, the GW121, allows our customers to maximise projects for low wind applications, with high load tolerance capabilities and full-power conversion for the best-in-class reliability, site suitability and efficient grid interconnection. The 121-metre rotor is designed to maximise annual energy production at low wind sites. The workhorse of the 2.5MW class, the GW109, allows our customers to maximise projects with medium and high wind speeds. With superior load tolerance capabilities and all the benefits of the 2.5MW class, the 109-metre rotor will maximise output at energetic sites.